It's like Someone read my mind, then put it on the Internet!!! i'm wondering why Gingrich would choose a lighsaber over his more recently celebrated flamethrowing flute. It probably has something to do with ghosts not being hurt by fire. I dunno. But it is an interesting development. The supernatural implications are quite significant, but the fact that this has wrapped itself up in politics may very well destroy the "never discuss religion or politics at the dinner table" in one fell swoop. It's really a double whammy. Maybe even a triple. The internet once again proves that Flute Gingrich may understand America, but the dead America still rises against Fluteykins. Thank you, internet. Thank you, makers of flutes. He can't be president (again)! How do you pay a ghost? How do you shake his hand? What if the President of Mexico (for instance) spooks easily? Call it blatant ghostism, I don't care, I won't vote for him (it). A lonely day for ghost-steering-wheel. You cannot be friends with the humans. Why couldn't the ship you were connected to return to life as well? It is a cruel unfair world. As an Attorney, I can hereby say that there is Nothing in the Constitution which prevents a ghost from running for president and/or dancing the hoochie-coo. WiFi dog is a girl?! That explains the tail then. Eagle is a girl because she has babies. Big deal he was the first president!! Wy do all children have to learn about him? Why not Martin Van Buren? At least he sounds like a vampire !!! Ya know what everyone should give Martin Van Buren a chance!!! Have ya seen his mutton chops??!! They are a heck of a lot better than his wooden teeth. I hope he didn't invent dentist insurance. And ya know what if you don't like Van Buren (which I can't see why, I mean the guys got mutton chops) you could say hi or recognize Benjamin Harrison. To all of you who don't have mutton chops please consider the following: Martin Van Buren had 'em and now we recognize him as the best president ever, and not only does the next person have anger and social issues he has mutton chops to it's Wolverine, and I'm am almost positive ( after all I do follow him home a lot) that Gamzu if I may has mutton chops! Case closed. They say "live by the sword, die by the sword." But the dead ex-president-running-for-president is holding a sword. Is that a good or bad thing? What does it all mean?! 11 out of the 16 frist president where slave owners, George was one of them eny way watch my Photoshop blog. Wow! Where do you get these pictures? I didn't see this on CNN! Man, where have you been? So much has happened. First they killed proudy and then there was a soda war and also Vampire Rick started hanging around threatening to do Bar Mitzvahs and follow people home. There was wifi dog and Newt Gingrich played a flaming flute. And the whole time people were all like where's ANDREA? and I invented some internet jargon like AAT and DM. And then I started a small cottage industry where people can make stencils of themselves or there loved ones and have those stencils reproduced in various sizes. So for instance you might want a giant stencil of your sister painted on the side of a wall in your apartment. Or a a teeny tiny stencil of your loved one that you can sketch on a paper next to your signature. AAT I have also been working with people to try to convince them to use href tags, but every once in a while they were all like Where's Andrea? Good to see you. I can't wait to visit your photochop blog and see what photos you have been chopping. AAT CAN GEORGE WASHINGTON ASK PROUDY WHO MURDERED HIM? AAT WHAT DOES AAT MEAN AGAIN? You are probably too young to remember when George Peppard played Banacek in a television series by the same name. He would always get his man. This was long before he played Hanibal on the A-team. What would Mr. T say if he could see George Washington's Ghost just one time? You know he is still very rich from all of that gold he used to wear around his neck. Have you seen the price of gold lately? He would probably not say "I pity the fool who goes around ghosting up on people" I think he would be too respectful and maybe a little awestruck. George Peppard would probably chomp on a cigar and say "I love it when a plan comes together" even though it wasn't even his own plan. Yeah. Banecek was pretty cool. So was the A-Team. I never saw the movie. While everyone was hung up on Matlock in the early 90's, i was watching Magnum P.I. and MacGuyver, filling in the weeks with reruns of Mannix, Kojak, and The Rockford Files. Once Law and Order hit the scene, we knew our private detective and unorthodox solo police detective heroes would be lost forever. I bet if any of those old crochety detective types were around, they'd get to the bottom of Proudy's murder, and probably expose all of the presidential candidates in some way or another. 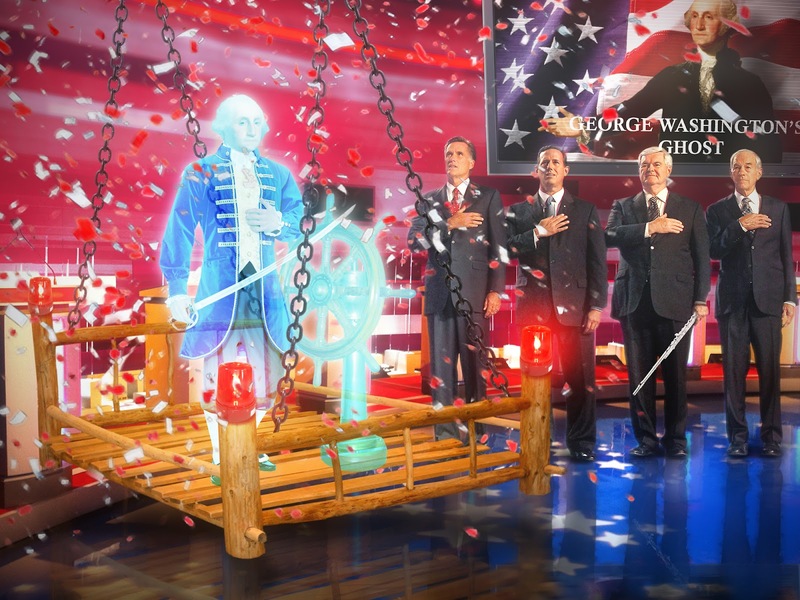 Not least of which, George Washington's unlawful years spent as a Ghost Pirate. Even now, he can't steer his political campaign without the rugged old helm of his phantasmic clipper. AAT one time Columbo dropped a phonebook on the floor to find out what the page last number called was on (this was before phones had redial). I used this technique on a large novel after misplacing the reader's bookmark. DM Gamzu: Vampire Rick is not interested in solving murders or being glizzled, haggard, or otherwise unkempt. I'd watch my back if I were you. But after those mutton chops comments, I think he's on the wrong trail, but don't tell him I said so. Fantastic photo. This year's election has been quite crazy. Hope you'll check out my window tinting blog, we're a local business headquartered in Grand Prairie, Texas. Great photo, thank you for sharing! Please take a look at our website, we're the leading painting contractor serving Massachusetts. Check out my great new roofing blog. If you like these photos I think you'll definitely appreciate it! Great post. I think you'll like my IT blog that focuses on data center management software. Data center management software will definitely be the wave of the future, as it provides a great way to optimize your data center management operations.